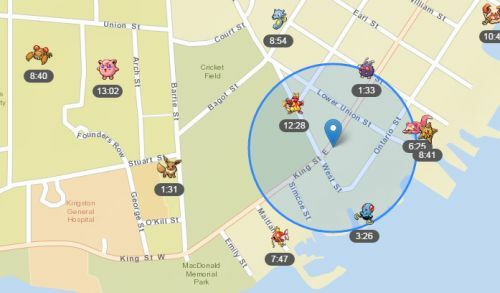 Welcome to the complete guide to Pokemon Go in Kingston, Ontario. Last Updated: November 5th, 2016. 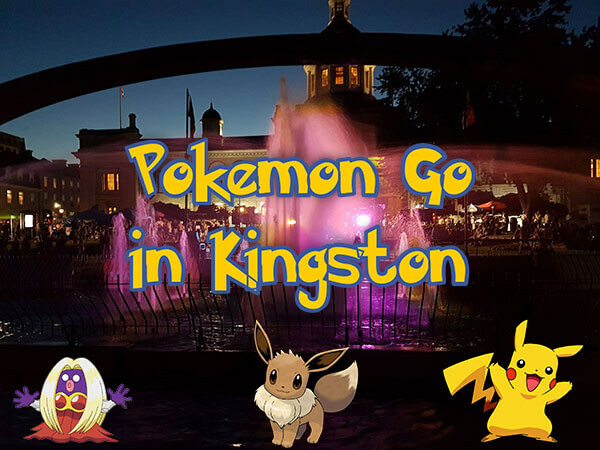 If you live in Kingston or are visiting here and are looking to play Pokemon Go then this guide is for you – it gives you everything you’ll ever need to play Pokemon Go in Kingston. This guide is broken up into sections and if there’s anything I should add, please send me an e-mail – see the form at the bottom of this page. Confederation Park: Confederation Park is the #1 “go to” place for all Pokemon Go players in Kingston. 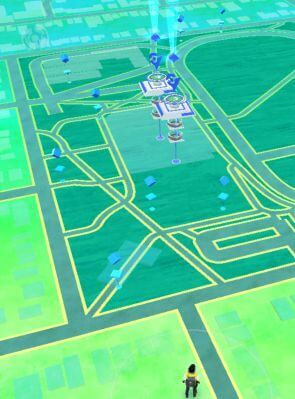 It has 5 Pokestops within the park all extremely close to each other and you could hit all 5 within one minute, as seen in the image to the right. You can usually stand in the same spot and hit at least two at the same time – and sometmes more. This is the most popular place by far and it’s rare you’ll go there and not see any lures. People put lures on every Pokestop constantly. All around that area there are other pokestops too and they usually have lures. On top of that it has a few Pokestops in close proximity. 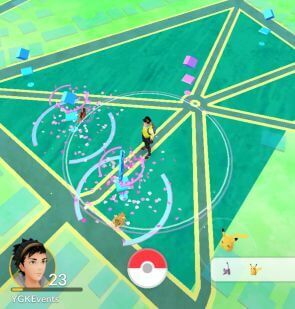 At the top left of the park in that image there’s a Pokestop you can hit without leaving the Park. And then you walk along the top of the park and there’s another Pokestop you can hit at City Hall. So all in all you have 7 Pokestops which is right beside the water and full of lures. If you’re looking for the best Pokemon Go location in Kingston, Confederation Park is it. There’s also free wi-fi there. Wolfe Island Ferry: On the hour every hour, the ferry leaves Kingston and goes to Wolfe Island. It takes approximately 20 minutes to go there, and then waits at Wolfe Island for 10 minutes while people depart and get on the ferry. 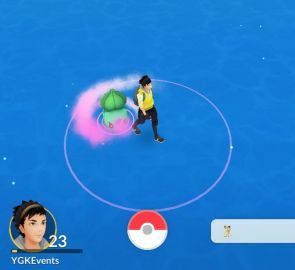 It’s became extremely popular for Pokemon Go, due to the fact that out in the middle of the water you can catch an absolute ton of rare pokemon. All you have to do is throw out an incense. Due to moving and the remoteness of it, you’ll get about 20-25 Pokemon – many of them rare. As an example – during one trip there and back I got the following: Kabuto, Rhyhorn, Electabuzz, Pikachu, Meowth, Abra, Raichu, Sandshrew, Sandslash, Mankey, Oddish, Diglett, Nidoran, Doduo, Exeggcute, Bulbasure and many more. There’s a Pokestop at the ferry on Wolfe Island but it’s often difficult to hit that unless you’re right at the very edge of the ferry and even then it’s hit or miss. Just be sure to stock up on pokeballs before you go! The below locations are ones you should probably check out for various reasons. 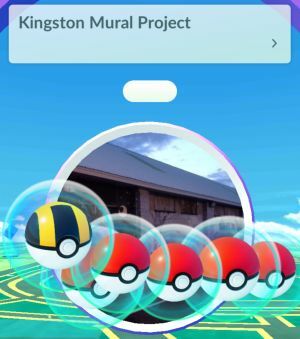 Memorial Centre(pictured): When Pokemon Go first came out, the Memorial Centre looked to be one of the best spots in Kingston. I mean just look at the screenshot on the right – there are 8 Pokestops all within a perfect loop. It will take you about 5 minutes to walk from the first one to the last one, meaning you can then loop around and hit them all up again immediately. On top of that it was initially a Scyther spawn point. I run the track at Memorial Centre a few days a week, and it was common for me to meet complete strangers also playing Pokemon Go and run with them, or just stop and chat to them. With the water park and a great kids play area you’d think it would be huge. Unfortunately that was not the case. There are very rarely lures there and when there is it’s unlikely to be more than one. Pokemon also rarely show up there without lures. I’ve did multiple loops getting at most 1 per loop. Despite that I still love the Memorial Centre when it comes to stocking up on items. With so little Pokemon to distract you, it’s a great way to spend 30 minutes getting a ton of Pokeballs. Hillside Park: This park located on Montreal St seems to attract a good variety of different Pokemon and has a Pokestop. There is another Pokestop just 30 seconds away at the Ukranian Church as well. Pokemon I’ve seen there in the past include Hypno, Onix, Squirtle and more. Just down the street from it – at Raglan and Bagot – is another hot spot where I’ve seen the likes of Bellsprout, Seadra and Squirtle. Iron Duke: The Iron Duke has a Pokestop just outside it, and it’s also a nice area to catch a lot of the more common Pokemon. Good time to stop and stock up and have a meal or a drink. Lone Star: It’s close to Confederation Park, and I’ve found sitting out on the patio you’ll get quite a few of the basic Pokemon pop up every few minutes, most likely due to the close vicinity to Confederation Park. No pokestop though. Sir John A’s Public House: There is a Pokestop right outside this pub, making it a great place to stop and have a meal or a drink while stocking up on Pokeballs. Skeleton Park(pictured): Much like Memorial Centre, Skeleton Park was another location that initially looked like it would be one of the best spots in Kingston. With 5 Pokestops around it, 3 which you can practially sit at and activate, it was the “go to” place initially. However after a couple of weeks it stopped being that go to place, and you only see the odd lure or two every couple of hours there. There’s more thrown out when events are on however and they can attract some good Pokemon – I’ve got some like Squirtle there in the past with lures out. When it comes to nests however, it’s a good one because as you can see in the picture Pikachu shows up often there. When he’s not around, Ekans is the one that spawns usually. City Park: With 10 different Pokestops you’d think this would be a prime location. However due to the size of the park you will rarely see many Pokestops lit up. Right at the entrance of the park however is a cluster of 3 pokestops and that is the most common area to see 3 lures at once. 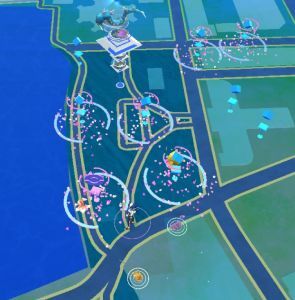 Queen’s University: There’s quite a good amount of Pokestops in the Queen’s University district, although many require walking around a fair bit. The theory is that with the students back, this entire area will be lit up like a Christmas tree. We’re yet to see that though. A “spawn point” or “nest” is a location where a Pokemon regularly spawns. The nests are updated from time to time however, so this list isn’t where Pokemon are spawning right now – but rather where they HAVE spawned in the past. In the short history of Pokemon Go we have seen this rotate. For example – Skeleton Park was a Pikachu spawn point when the game first came out. That changed, but a month later Pikachu was spawning there again. I used to have a huge list here however after studying Pokemon spawns over the last couple of months I realize this isn’t that helpful. Omanyte started showing up like crazy around the bottom of Earl St for a few days for example then disappeared. Unfortunately that’s closed now. The best option is to check with the Facebook groups linked below and see what people are posting about spawns or ask for a particular spawn. 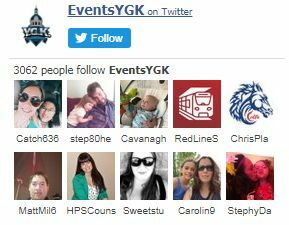 There are quite a lot of local resources on social sites for Pokemon Go in Kingston. They can be good for discussions, updates and learning about Pokemon Go in Kingston. Lucky Egg XP Trick: The Lucky Egg will double your XP for 30 minutes. Don’t waste it – save it until you have lots of Pokemon to evolve. This is where all those Pidgeys come in handy! You get 500 XP every evolution, so every time you evolve you will get 1000 XP due to the double XP. You can usually evolve 55-60 in that time limit if you’re quick enough. Don’t do anything else BUT evolve. Lucky Egg XP Trick – Additional Tips: Rename all of the pokemon you wish to evolve to the number 1. When you do that, they will be all at the top of your list making it very easy to flick through evolving and then you don’t waste any time trying to see what ones you have to evolve. Also start the Lucky Egg process when you have an egg in the incubator ready to hatch – say at 9.8/10k. You’ll get 1,000 XP for a 5k egg and 2000 XP for a 10k egg. And then if it is a new Pokemon you don’t have, you’ll get a bonus too. On top of that only evolve a 2nd level Pokemon if you don’t have the 3rd level. For example if you have Caterpies and Metapods but have never caught a Butterfree – don’t evolve your Caterpies. Instead save up until you can evolve Metapod. Then you get bonus XP for a new Pokemon. The 10 Pokestops Trick: Don’t keep hitting the same Pokestop over and over. Within 30 minutes hit 10 different pokestops When you hit that 10th one, you get extra items – at least 6, and also 100 XP as opposed to 50 XP. Eevee Evolution: Eevee evolves into 3 different Pokemon – either Vaporeon, Jolteon or Flareon. You can control which one Eevee will evolve into by naming him prior to the evolution. It’s Pyro for Flareon, Rainer for Vaporeon and Sparky for Jolteon. Be sure to close the app down after renaming and prior to evolving. 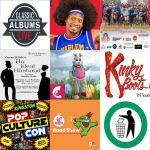 Q: What are the most common Pokemon in Kingston? Drowzee, Pidgey, Rattata and Spearow are the most common ones you’ll see everywhere. Q: Where’s a good place in Kingston for free wifi and Pokemon Go? 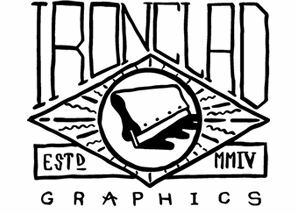 This entry was posted in Blog on September 6, 2016 by graemescott.